The eve of the 100th anniversary of the Douglass Community Association is an auspicious time to welcome a new director, especially one as well-suited for the job as Sid Ellis. Ellis, who took the helm in late October, brings a unique mix of arts, health and community promotion experience to the Douglass, which is home to a dozen nonprofit organizations that provide social services, arts, youth enrichment, education, and employment support. 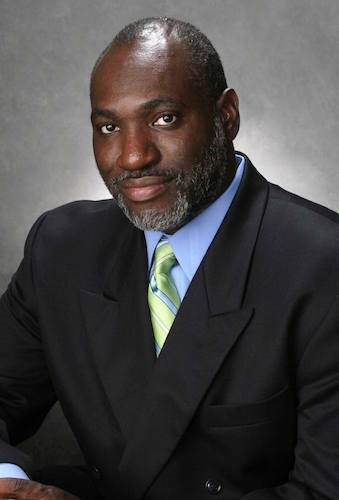 Ellis, who formerly served as director of the Black Arts & Cultural Center, Kalamazoo Colleagues International, and as Mission Director for the YMCA, says he sees himself as an all-around “community servant” who looks forward to supporting and facilitating the Douglass’ wide-ranging offerings. The Douglass, which opened first as an African American social hall for troops stationed at Fort Custer, has grown and changed over the years to fit many of the social, recreational, cultural, employment, and financial support needs of the Northside community. With the 100th anniversary to look forward to in 2019, Ellis says that his first year will be focused not so much on creating new programming, but supporting and collaborating with the current organizations operating from there, and enhancing partnerships with other community groups, such as the BACC and Peace Jam. Currently, the Douglass houses over 12 organizations, including the Boys and Girls Club, Best Baby Zone, Urban Alliance’s Momentum Program, and Kalamazoo Loaves & Fishes, the Helen Fox Gospel Music Center and its newest addition, Rootead Enrichment Center. Sid Ellis, new Executive Director of the Douglass Community Association, sees his role as a natural extension of his role as "community servant.”The Douglass will also soon be home to a Financial Opportunity Collaborative, a “bundled” approach that includes job training, placement and credit repair, co-sponsored by Urban Alliance, the Kalamazoo neighborhood Housing Services, LISC and the Douglass. A ribbon cutting for the new collaborative will take place at the Douglass noon, Thursday, Nov. 29. “I see my role as helping programmers here in the building and our partners do what they want to do,” says Ellis. As a neighborhood fixture, the Douglass has a variety of attributes. The large community room has hosted countless community events and parties, and the gym has been home to several years of Yball, the YMCA’s youth basketball league. The building also houses a neighborhood jewel, the Alma Powell Branch of the Kalamazoo Public Library. And although the Douglass turns 100 (the current building is its third home), the building itself is turning 25. Over the past few years, the building’s gym, while still used by the Boys & Girls Club, has had heating and cooling issues. In the coming year, following repairs, the Douglass will once again host Yball, as well as its own youth basketball league. To celebrate the centennial, Ellis says that there will be a large gala, as well as several smaller events to commemorate the organization’s rich neighborhood history. Currently there is a call out for photos and memorabilia. Anyone who has items that reflect the history of the Douglass is encouraged to scan and email them, or bring them into the office where they can be scanned and returned. A frequent story Ellis hears from patrons is about how the Douglass was such an important part of residents’ memories growing up on the Northside. Ellis is hoping those fond memories will turn into volunteer hours to keep alive the unique spirit of the center. Already, devoted volunteers, such as Tony Paterson, a well-loved and familiar Douglass fixture, keep the unique spirit of the Douglass kindled. 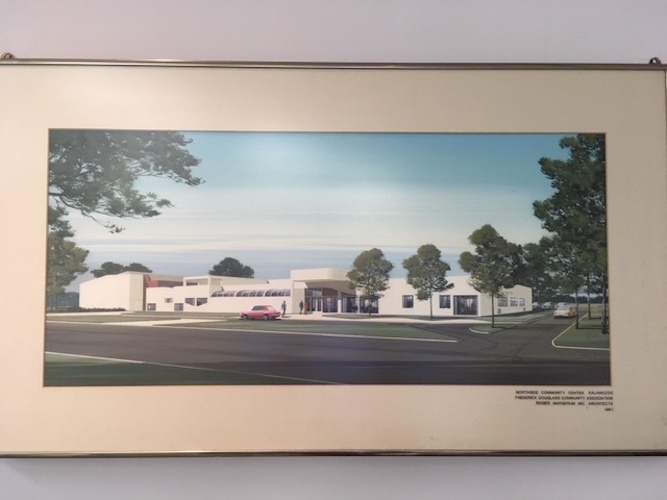 This artist's rendering of the present Douglass Community Association building hangs in Sid Ellis' office.While it’s been less than a month on the job, Ellis looks at home in his new office. He’s found a shelf for half of his Starbucks coffee cup collection, and on this late November day, has a pristine view of snow-laden trees outside the window. “The Douglass was and is the main organization for blacks on the Northside to meet most of their needs,” says Ellis. “We are still here to serve the Northside. We want to continue to be a location where people who don’t have the means to go out to their locations can get do what they need to do here,” he says. Michigan Works!, the Kalamazoo County Community Health and Human Services branch, and programs co-sponsored by the Kalamazoo Parks & Recreation Department address those needs. And Ellis hopes the Douglass will continue that tradition for many years to come.